Whether you have a small suburban backyard or a large farm, we strongly recommend that you plant at least one mulberry tree. Mulberries are best known for their sweet-tart fruit, which is one of our favorites both fresh and dried. They are wonderful in other ways, too. The leaves are excellent animal fodder, with a protein content at about 20% of dry matter (FAO 1998). That’s on par with alfalfa! The wood is fairly durable and rot-resistant. It’s often used to make lathe-turned bowls that have a beautiful yellow hue. 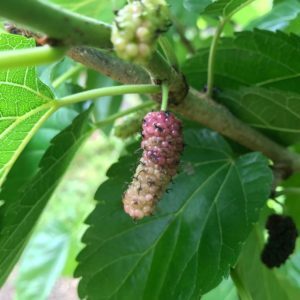 Mulberry trees grow fast and aren’t too picky about the soil that they inhabit. One species of mulberry tree is native to North America, and a few others have naturalized here. There are lots of reasons to love them! There are several other species, too (68 in total), but these three are the most common. It’s likely that M. rubra, which is native to North America, and M. alba, which was introduced to feed silkworms, have naturally hybridized here. Both M. rubra and M. alba can be found growing wild and feral in the Eastern United States. What we think of as a mulberry “berry” is actually an infructescence — that is, a collection of many tiny fruits joined together. 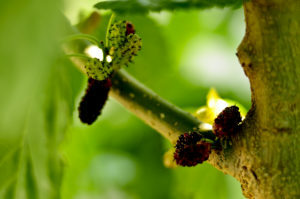 When the mulberry tree flowers, each “flower” is actually an inflorescence, or collection of many tiny flowers. Get out your loupe hand lens, and check it out! Mulberries are nutritional powerhouses. They are rich in fiber (including pectin), vitamin C, iron, and vitamin K. For a fruit, mulberries are pretty high in protein, with a cup of them containing about 2 grams of protein. They are also a significant source of calcium, magnesium, and several other trace minerals. Along with being full of nutrition, mulberries contain some important health-promoting qualities. They are full of antioxidants (even the white-fruited varieties), which help protect our bodies from oxidative stress that can lead to cancer and other diseases. In fact, an isolated compound found in mulberry juice was shown in a 2017 research study to help kill breast cancer cells. According to another study, one of the pigments in mulberries helps to control bad (LDL) cholesterol in the body. As far as fruit trees go, mulberries are pretty forgiving and adaptable. They thrive in full sun, with at least 15 feet of space between individual trees. They can survive in many different kinds of soil, but prefer loose, well-drained soil. Many mulberry tree varieties are somewhat drought- and frost-tolerant. White and red mulberries (M. alba and M. rubra) and much hardier and less finicky than black mulberries (M. nigra). It is said that the fruit of black mulberries are the most delicious. Because they don’t thrive in our climate, we can’t say for sure. It’s worth noting that “white” mulberry trees don’t necessarily bear white fruits, “red” mulberry trees don’t necessarily bear red fruits, and “black” mulberry trees don’t necessarily bear black fruits. 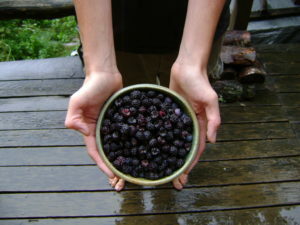 All species can bear fruits that range in color from white to dark purple-black. The white fruits are sweetest, but don’t have much tartness to enrich the flavor. The best tasting mulberries that we have tried have been red to purple-black. Mulberry trees can be found growing wild and feral. Often trees growing in the understory of a forest don’t much fruit because they don’t get much sun. Sometimes thinning the forest around a wild or feral mulberry tree can open up the canopy, bringing more sun to a tree and resulting in a crop of sweet fruit. Wild trees bearing poor-quality fruit can be grafted with tastier varieties to take advantage of the established root system. Pruning is not necessary with mulberry trees, except to clean up dead limbs or control the size and spread of the tree. Some red mulberries can grow to be 70 feet tall! Flowers bloom from first-year growth and from the axils of older wood. Mulberry trees drop their fruit over a period of several weeks. The darker-fruited varieties in particular can make quite a mess. Try not to plant a mulberry tree close to a road or sidewalk or over a place where you park a car to avoid purple stains where they are unwanted. Method of harvest: Ripe mulberries drop from the tree. This can be encouraged by shaking a mulberry tree. To prevent your bounty from being contaminated with rotten fruits, twigs, rocks, and other flotsam, we recommend laying a tarp down beneath the tree, then shaking it. Individual mulberries can, of course, be plucked from low-hanging branches for a snack. The tarp-shake method is best for bringing in a large quantity of fruit for processing. Processing and Preserving: Our favorite way to preserve mulberries is also one of the easiest: drying. Dried mulberries are a delicious snack, and they keep very well in sealed containers. We have found that using an electric dehydrator works the best, as mulberries are very juicy. Solar dehydrators in this humid climate can work, if an auxiliary fan is attached to them to increase their drying power. 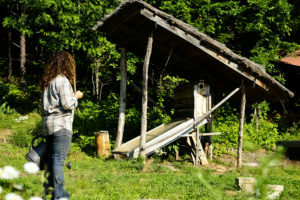 We have one such dryer at our site and teach about food preservation in our Earthskills and Permaculture Immersion. If mulberries are not completely dry when stored, they will mold. Mulberries make a good wine and don’t require as much additional honey or sugar as other fruit wines because the fruit is so sweet. Unfortunately the mulberry flavor is so subtle that it doesn’t come across very strongly in a wine. It can be fun to experiment with mulberry wines that also contain other, stronger-flavored fruits like elderberries, blueberries, blackberries and wild grapes. Freezing mulberries is another great way to preserve them. When defrosted, the frozen berries are more like a paste and are best used in smoothies, sauces and pie fillings. They cannot be easily eaten out of hand after drying. Because of their high pectin content, mulberries lend themselves to making jams, jellies, and other preserves. The pectin helps the preserves solidify, similar to how gelatin becomes more solid at room temperature after it’s been cooked. If you have an abundance of fresh mulberries and enjoy fruity spreads, canning up a batch of mulberry jam is a great way to preserve the harvest. Perhaps the most famous use for mulberry trees is in the feeding of silkworms. These silky-cocoon spinning caterpillars almost exclusively eat mulberry leaves, preferring M. alba. In the late 1800s and early 1900s here in North Carolina (and other Eastern states), “silk mania” took hold. Entrepreneurs and farmers learned of the high per-pound price that silk was fetching and the fact that M. alba could be cultivated here; they went crazy planting mulberry trees and raising silkworms. Unfortunately, their lack of preparation, knowledge and skill in the processing of cocoons into silk fiber, among other factors, led to a speedy demise of the North Carolina silk industry. Fortunately for us, the legacy of “silk mania” is an abundance of feral M. alba mulberry trees and the likely hybridization between M. alba and our native M. rubra.